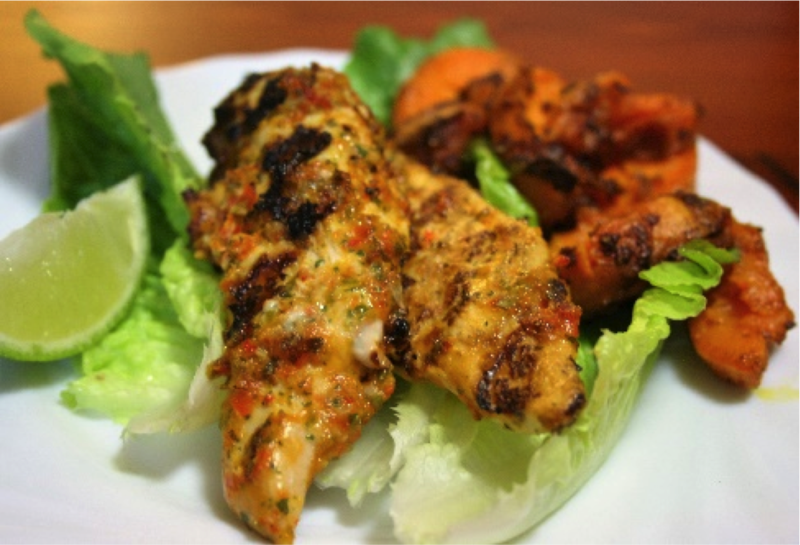 Home » Events and Blogs » Blog » Recipe of the week: (Not Too Hot) Chilli Chicken! Recipe of the week: (Not Too Hot) Chilli Chicken! I have cooked this meal for my family keeping in mind that they are not all that keen on all things hot and spicy. Despite the name, this has a balance of the right flavours without the burn of some chilli dishes. That being said, you could use a whole chilli where I’ve used half if you want that extra bite, or you could also keep the seeds in. Simply pop all of the ingredients above, apart from the chicken, into a small food processor and blitz for approx. 15-20 seconds or until a chunky paste forms. You could use a mortar and pestle here. It will just take a little longer. Place the chicken in a shallow dish and cover with marinate, leaving for 20 minutes in the fridge before grilling on the BBQ over a low heat. Serve on a bed of fresh, crispy cos lettuce, with some homemade sweet potato fries and a wedge of lime.